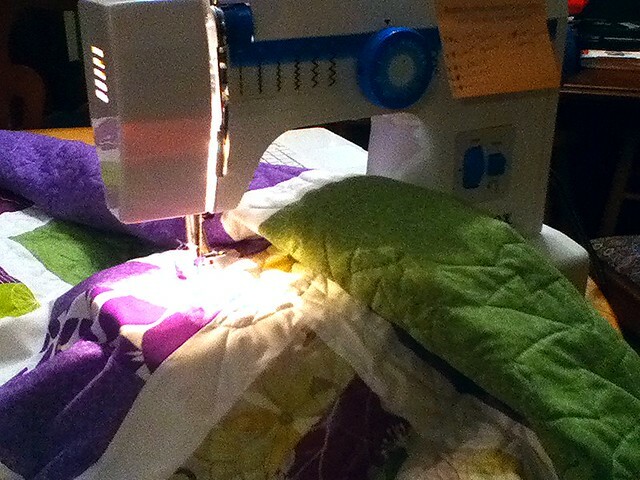 I made my way through 1/6th of the quilt before my free-motion quilting foot snapped my needle, and I spent the next few blocks of it keeping a sharp eye on the foot, as it gradually got chipped away by the needle going up and down. 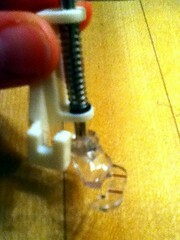 I had to cut away part of the clear foot to keep the needle from breaking again, which worked for only a little while longer. 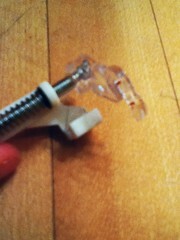 Then the foot skewed even further, and it became clear that this just wasn’t going to work: the shaft of it was cracked. 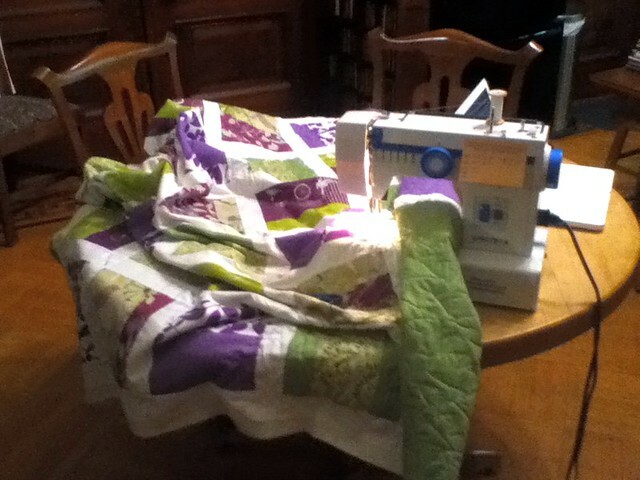 I got approximately halfway through the quilt, rolling it up on one side as I went along. 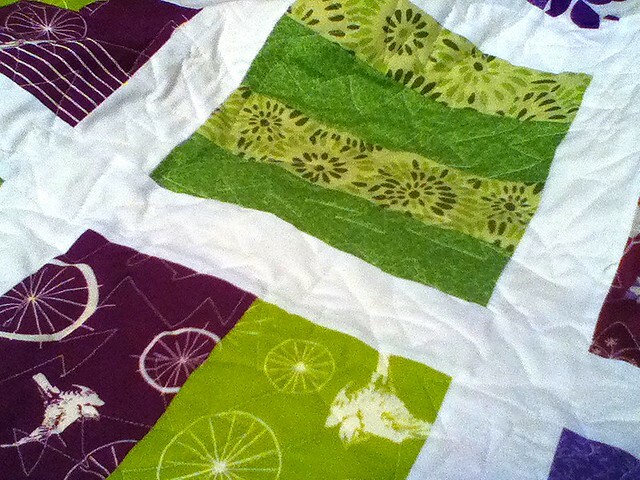 Still, I’m pretty happy with the quilting so far: it looks like I basted well enough to avoid puckering. The recipient asked for zig-zag lines, which I think are working out all right. Seeing as it’s the first time I’ve ever free-motion quilted anything, I’m not unhappy with it — just with the photography today. This is a beautiful quilt. Too bad about the free motion foot. I hope you leave feedback on Amazon and I hope it is not too late to get your money back! To be honest, the idea of asking for my money back hadn’t occurred to me, though I certainly plan on leaving feedback on Amazon in the hopes that other people won’t have the same experience. Yikes! Looks like it will be a great quilt though. It’s so frustrating to have technical difficulties like that! Still it looks great. Found your post at Plum and June! Previous Previous post: Conferencing is tiring! Next Next post: The Let’s Get Acquainted Blog Hop is going strong.